When to rotate your truck tires | Southern Tire & Fleet Service, LLC. Rotating your truck tires can be a smart idea on a properly maintained truck. The following information is a useful guide on when and how to do it. Southern Tire want’s it’s customers to get every mile possible out of the tire we install. Use these tips to get the most from your truck tires. 1. One common practice is to rotate steer tires side to side when there is a 3/32nd difference in remaining tread depth between the left front tire and the right front tire (Remember: the left front tire normally wears more quickly than the right front). 2. Some fleets rotate the steer tires side to side every PM. While this is more labor intensive, it helps ensure tire rotations are performed on a regular basis and before irregular wear has a chance to set in. 1. One common practice is to rotate the drive tires when there is a 3/32nd difference in remaining tread depth between the axles (the rear axle normally wears more quickly than the front axle). 2. Some fleets prefer to rotate drive tires at every PM. Again, this is more labor intensive, but assures rotations are done an a regular basis. 3. Many fleets highly recommend rotating the drive tires after 9/32nds to 10/32nds tread have worn. (For example, rotate most drive tires when they average 22/32nds tread depth remaining.) In this case the tires seldom need to be rotated other than this one time. Just as important as the timing of the drive tire rotations is the method used. 1. The most desirable method of rotation is exchanging the front axle tires with the rear axle tires plus switching inside / outside wheel position. (This would be an “X” rotation on the same side of the vehicle) LFO <> LRI; LFI <> LRO; RFO <> RRI; RFI <> RRO. This method assures a change of direction of each tire that helps control heel/toe wear, and change of axle that compensates for different wear rates between the axles, plus a change of position to control the effect of negative axle camber when loaded. 2. However, method #1 has a drawback. Many trucks are equipped with wheel styles that make method #1 very labor intensive (Polished Aluminum wheels out, non-polished wheels in; aluminum out, steel in; or just the dirt and grime that builds up on the inner wheel making it too unattractive to be rotated to the outer position.) If this is the case, you may want to consider just “X” rotating the tires between the axles. LFO <> RRO; LFI <> RRI: RFO <> LRO; RFI <> LRI. This method at least rotates the tires between axles and reverses direction of rotation, but it does not address the effect of negative axle camber on the inner tires. 3. The least desirable method of rotation is the simple front to back, back to front. This helps equalize the difference in wear rate between the axles, but it does not reverse the direction of rotation so it has little to no effect on irregular wear. 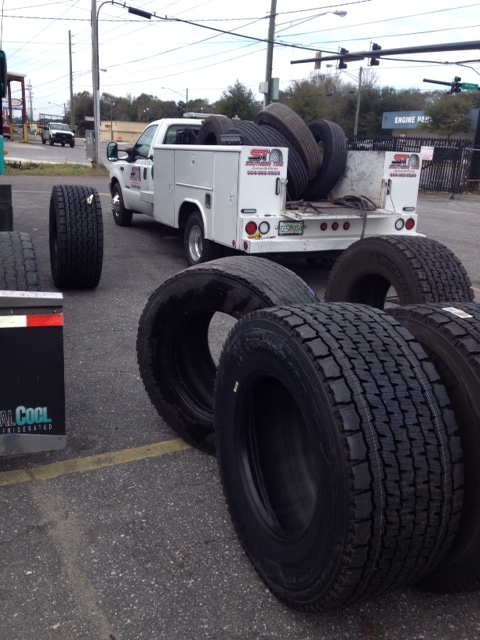 Give Southern Tire a call at (904) 389-7233, we are available 24/7 for all your tire related needs.